Forrester, Neustar and the Association of National Advertisers (ANA) commissioned Forrester Consulting to survey 150 marketing decision makers from US companies that are members of the ANA to understand their analytics cultures. Marketers already know the importance of data. However, becoming truly data focused relies on more than just implementing the tools and technology. To empower your teams and see stellar business results you need to develop an analytics culture. The companies that are mastering the analytics culture are those where their employees are fully aligned on using data and analytics as the primary factor behind decision making. Not surprisingly, the findings from our survey, in partnership with the ANA, reveal the strong advantages companies realize who are mastering measurement and analytics compared to those who are just beginning to build out their cultures. 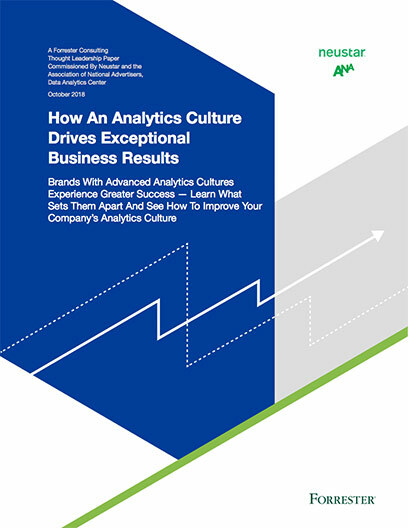 Download your copy of the Forrester study, How An Analytics Culture Drives Exceptional Business Results.